Today’s 2in1: Freedom of expression and Paranoia! Around two weeks ago I heard in passing a news item on TV saying that an Iranian Arts and Culture festival is going to be held at the National Theatre and The Arts Palace (formerly Saddam Modern Arts Centre). This happened around the time our officials and Iranian officials were working hard to get into the Guinness Book of Records for the most flights clocked between Iraq and Iran in a fifteen-day period. This unprecedented public display of affection between the leaders of the two countries was making a lot of Sunnis here very nervous. 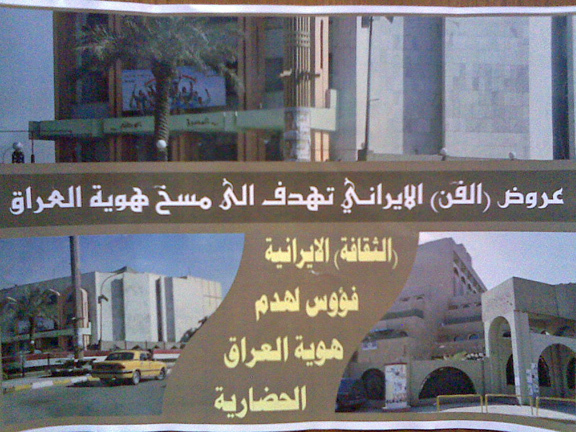 The text across in white says: “Iranian (art) exhibitions are aimed to distort Iraq’s identity”. and below it in yellow: “Iranian (culture) is an axe poised to crush Iraq’s cultural identity”. And the images are of the national theatre and the arts palace. I found this yesterday stuck to a lamp pole on the main street. Clearly someone had too much coffee sprinkled generously with ‘crazy’ that morning to come up with slogans like these. But it does touch on a raw nerve with some sectors of society here. The constant schmoozing and visiting isn’t helping either. And I guess it’s a free country now.. so as long as they won’t be doing anything nasty they can put up all the posters they want. There is another version of the poster, you can see it here.. (that website isn’t what I’d call an unbiased news source by the way. Very pro the ‘old days’). This poster says: “Iran is spreading ideas to stop the unity of Iraq’s people and land”. The photos show the National Theatre and Arts Palace so they’re referring to the Iranian arts festival as well. This entry was posted on March 9, 2009 at 5:45 pm and is filed under Uncategorized. You can follow any responses to this entry through the RSS 2.0 feed. You can leave a response, or trackback from your own site. Salam, any idea whether one is able to “see” the Iranian exhibits online? Did the iraqi media report on the exhibition and its contents? Very interested how this exhibition aims to “Demolish the iraqi identity”. sigh or lol? not sure, probably both. Do Iraqis even have an identity after all the turmoil? It seems with 57% unemployment and a government that is under pressure from multiple directions…no identity is to be had. Here in America, things are being said about Iraqi Democracy that are troubling to me. Does a separation of powers exist in Iraq? Is there an undercurrent of hisbah Morality police on the make in any of the departments of state? I agree. Very interesting post, Salam. I can’t believe this is my first comment on your blog. I’ve heard so much about you since I started reading the Iraqi blogosphere, and I thought you retired. I’m glad you didn’t. You are a great writer.